Hope everyone has had an enjoyable holiday and been as fortunate as I have, to spend some time with your families. Here's a cute little video with the Budweiser Clydesdales. EXTRA EXTRA!!!! READ ALL ABOUT IT!!! NEW HORSE IN THE BARN! Yes she has arrived and is doing exceptionally well. Well, except for the lack of NAME! "Fluffy" as she has been called her entire life (if you can imagine-poor thing) arrived at London City Stables after a terrifying drive in white-out conditions from Michigan. Originally owned and trained by Stacy and Jessie Westfall who remember her as a "very sweet mare that we let the kids ride - maybe a 70 or 71 horse" (I will explain this later), Fluffy is bred to rein. Her date of birth is March 6th, 2000, which means she's coming up to her 9th birthday January 1st. For those of you who read that last paragraph and were WAY confused, allow me to explain breifly. A "70 or 71 horse" refers to what score the Westfalls guess that Fluffy would be capable of for a reining pattern. In a reining pattern, the base score is seventy. The pattern calls for 8 maneuvers, each one beign scored between -2 and +2. This means, that if you perform each maneuver correctly, without any penalties, you would leave the pen with the same score you went in, which would be a 70 (WAY harder than it sounds). Extra points are awarded for horses who perform a maneuver with notable quickness, authority, confidence, etc. The fact that the trainers claimed she is a 70 or 71 horse probably mean she doesn't have any major issues with any one maneuver and could complete a pattern with a score of 70, maybe even plus 1/2 here and there. The birthday thing: each registered Quarter Horse has a set of papers that give full details about the horse, it's AQHA number, it's registered name, it's birth date etc. Since the show season overlaps with the breeding season, and since many classes are based on the age of the horse, there needed to be a cut-off for the birthdates. The AQHA considers every registered Quarter horse to be born Jan. 1st of the year they were born in, for show purposes. So, Fluffy was born in March of 2008, which means she will be 9 years old on January 1st, 2009. That is one of the advantages of breeding for an early birthdate. Imagine competing on a 2 or 3 yr old horse, who is actually 6 months or more, younger than the competition! Markings: Star, strip and snip extending onto upper lip. no other markings. The plan for Fluffy is to (FIND A NEW NAME) work on her feet a bit and see if we can correct some lameness issues she has been having, and to show her through the spring and start the transition into being a lesson horse. I have decided to have a vote for the name of the horse and let the students decide. Nominations for names have been: Samson, Patriot, Ginger, Tinkerbell, Peanut, Sweet Pea, Snowflake and Honey. So far, it looks like Sweet Pea is in the lead. If you haven't voted, please tell me your preference ASAP. Fluffy looks a little worn out from her long trailer ride from Michigan, the first time in the barn and arena - her new home! Thanks to everyone who has stuck with me in 2008. It's been a pleasure and I hope to continue growing throughout 2009 to serve you better. It seems like such a long way I have come since I started on my own in the early summer - what a great group of supporters I have! I would love to come up with some more in depth programs to commit to you. I am looking to find a facility that wil better suit our needs, and until such time I am hesitant to lock anyone into a contract of any sort. As a compromise, I have come up with the bundle prices that are up on the main website under "Coaching". I would encourage everyone to purachase a bundle and book with me your riding times with as much notice as possible. Since it's a "ONE MAN SHOW" for the most part right now, my time is limited. I would really appreciate the extra notice, and the ability to reserve that space just for you. Please note that I will be happy to reschedule any ride, with 24 hours notice. The full amount of the lesson will be forfeited if I have less than 24 hours notice, which will enable me to reschedule rides for other students. I will be putting together some type of student information form and waiver which will help with my insurance and give me some better ways of keeping track of the best ways to get a hold of everyone, birth days, year-end receipts etc. Thanks again for your patience and support while I get things running. I will be putting together some Day programs with topics like: mane and tail braiding, tack cleaning, ground work, massage therapy etc. Please let me know if you are interested in any of the above. 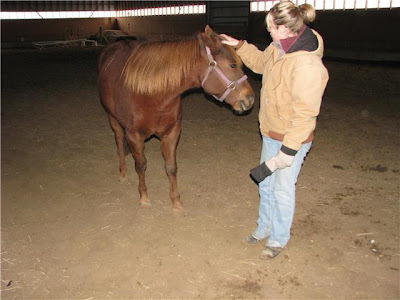 These programs are a great way to extend your exposure with the horses as well as your knowledge of the animals and the responsibilities of caring for them from day to day. FOR THE NRHA FUTURITY IN OKLAHOMA! 3-year-old horses ridden for first place prize money of $125,000 with a total purse and prizes totaling over $1.5 Million to exhibitors! More than 1,800 horses and 4,000 exhibitors competing in all classes, three special reining horse sales, an intercollegiate judging contest, and approximately 70,000 spectators. NRHA's finest million dollar event held in late fall in Oklahoma City, Oklahoma. If you are interested in learning more, click on the logo to get to the NRHA website. The website hosts livefeed to what's going on in the coliseum. Saturday night is the futurity finals, it's definitely worth watching! As a girl who wished for a horse every year at Christmas time (until I was finally was able to get one myself) I can relate to many of my young students wishes at this magical time of year. Tara Houston would have fit right into this category of girls wishing and praying and dreaming of the day when they could have a horse of their very own, had I been privileged enough to be her riding coach as well. Tara was diagnosed with a brain stem glioma in the summer of '02 at seven years of age. A terrible shock to her family and friends, and suddenly making every moment seem more precious than the last. It became the mission of her family and their support network of friends, neighbours, co-workers and relatives to make Tara's wish come true. The Make-A-Wish Foundation became involved and got to work on finding "horsey-contacts". That's where I came in. Through a close friend who volunteered for the foundation, I became a source for advice and an extra set of hands for when the horse was delivered. "Buddy Boom" as Tara named him, arrived in September to a crew of people who had been working all day to get the fencing put up, a lean-to and all the little extras, right in the Houston's backyard. I admit I was worried when the horse stepped off the trailer. Knowing the fragile physical state Tara was in, and the fragile emotional state everyone else was in, we NEEDED a quiet, gentle horse. Buddy seemed to be pushy and ignorant and refused to pick up his feet for me to check out. He pulled hard on the lead rope and became more and more worried. What would happen when this delicate 7 year old girl wanted to lead him? Or ride him? What would happen if she got attached to him but he just wasn't safe? What would happen if we need to get a different horse? Would there be enough time to find another horse? Tara met Buddy that day and immediately began calling him Buddy Boom. Buddy Boom was a totally different horse than the Buddy I had been handling moments earlier. Buddy Boom was quiet and gentle, with a soft understanding look in his eye. He didn't pull on the lead rope, he followed Tara around like a puppy. It was like nothing I had ever seen, and have not seen since. Their bond grew as Tara's condition worsened. Buddy Boom would lay with his head in Tara's lap while she stroked his hair and spoke to him. He would call to her each morning. After fighting bravely for several months, Tara passed away in February of 2003, shortly before her 8th birthday. It must be mentioned that with no previous medical conditions, at 17 years of age Buddy Boom also passed just days before Tara. After what must have been truly devastating, the Houstons have kept Tara's memory vivid in our minds through a beautiful garden that mother Sheri, and father Scott maintain. Tara's favourite flowers were sunflowers, which also became the theme (along with her favourite colour-purple of course), of the foundation they started in Tara's name. The foundation helps to provide support for families like the Houstons with terminally or chronically ill children in their time of need. Over the years since Tara's wish, I have seen what the foundation has done for these families. I have met and spoken with them and realized what it meant to have the foundation backing them. Travel to and from hospitals or medical facilities to receive treatment. Accommodation expenses while the child is receiving treatment at a facility that is outside the geographical area within 200 kilometres of the family's primary residence. Treatment not funded by the Ontario Health Insurance Plan or by private insurance held by the family. Assistive devices or specialized equipment required as part of the treatment, and not funded by the Ontario Health Insurance Plan or by private insurance held by the family. Funds to subsidize daily living expenses of both parents or the primary caregiver (in the case of single parent families) should they become unable to work because of caring for their child as a result of their illness. These funds may be used for mortgage payments, utilities and/or groceries. This year, I am asking my students to help me in support of the foundation which is currently helping three families through this heart-breaking time in their lives. Please visit the TARA BOOM HOUSTON CHILDREN'S FOUNDATION. Regular students will receive a gift certificate valid from Dec. 19th to Jan. 4th only. Any rides scheduled during this time will be discounted the $10 gift certificate as recognition and as a thank you for your support over the past few months. I am suggesting, for those interested in supporting the foundation, that they pay the full $40 rate, and the $10 from the gift certificate will go directly to the foundation. Being involved in the Houston's story and getting to know Tara has enriched my life in ways I wouldn't have thought possible. A few years ago I was asked to write an article for a magazine about my experiences with horses and as a graduate of an equine college (you can read my article on my main website on the "About" page). In writing the article I discovered the most enriching experience I had to share was my experience with Tara. This is the main reason why I want to share this opportunity with my students. Although you will not have the pleasure of meeting Tara, being involved in your community and finding out what horses mean to others around you is a great privilege. And hey, how 'bout we dedicate our rides over the holidays to Tara?